Huge Savings! 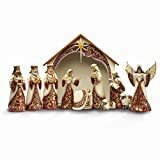 Up to 13% off on Nativity at Centre for Northern Families. Top brands include TII Collections, Fontanini by Roman, Church Supply Warehouse, Jim Shore Heartwood Creek, BCD, Transpac, Roman, Enesco, Unknown, Santa's Workshop, & Regency. Hurry! Limited time offers. Offers valid only while supplies last. Santa's Workshop Woodsman with Canoe Figurine, 16"
Santa's Workshop Yuletide Fairy Figurine, 10"